The department is excited to welcome two new faculty into our GIScience program and the Spatial State Science and Technology major. The CAS Dean’s blog recently featured [profiles of both Henry and Carolyn on their blog. You can read about Dr. Henry Luan here and about Dr. Carolyn Fish here. 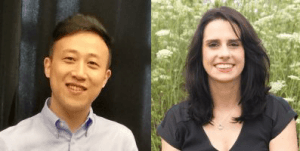 Both Carolyn and Henry will be teaching some of the introductory GIScience courses in addition to their specialties, which expands the offerings that our students in Spatial Science and Technology can take.